Image caption Auction house officials describe the phone as a "weapon of mass destruction"
A telephone used by Adolf Hitler during World War Two is to be auctioned in the US this weekend. 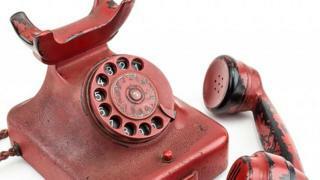 The red phone, which has the Nazi leader's name engraved on it, was found in his Berlin bunker in 1945. Soviet soldiers gave it to British officer Sir Ralph Rayner as a souvenir shortly after Germany surrendered. Auction house Alexander Historical Auctions says bidding in Chesapeake City, Maryland, will start at $100,000 (£80,567). It hopes that the phone, which is being sold by Sir Ralph's son Ranulf, can fetch as much as $300,000. Auction house official Bill Panagopulos said the phone was a "weapon of mass destruction", as it was used by Hitler to give orders that took many lives during the war, the Associated Press reports.